Most of the gravestones in Hatfield's Hill Cemetery are slate, granite, or marble, but a few of the earliest are made of local red sandstone. Several of these were carved by Joseph Nash, who seems to have been a part-time or self-taught carver. His letters are rough and his stones have irregular shapes and barely any decoration. 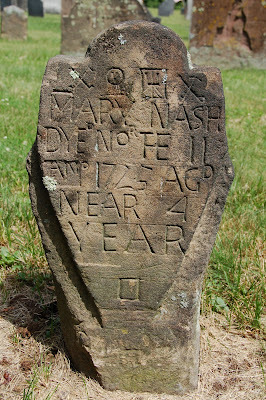 He does seem to have embellished stones by gouging out steps in the surface of the stone — a technique often used to cut out a mistake, but seemingly employed for effect on the John Belding stone (1725). If that's true, I would guess that Nash may have lived near Boston at one time and remembered that style after he moved west. 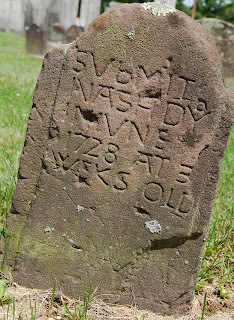 Those symbols are uncommon on Boston-area stones carved after 1700, but Nash was carving them on his family's stones in the 1720s. This may be an example of an old-fashioned style surviving in a rural area after it has fallen out of fashion in Boston.